A Womanity Fesztiválon jártam pár hete. Nagyon tetszett az esemény mert nagyon jó látni, hogy mi Nők mi mindenre vagyunk képesek. A napot Katie-vel töltöttem, aki Magyaroroszág egyik legnagyobb cégének a managere, Virággal aki több, mint amit egyáltalán savakba lehet önteni. Kövessétek instagramon és megértitek miről beszélek és Lillával, aki egy tetőtől – talpig üzletasszony. Elképesztően inspiráló ilyen emberekkel találkozni, nagyon élveztem. I have been invited to the Womanity Festival a few weeks ago. I loved every second of it, it is amazing what we, women can do in this world. I spent my day with Katie who is one of the biggest IT company’s manager and Virág, who is more than what I can put into words, follow her instagram and you ll understand me and Lilla who is a real business woman already. In that day I decided to dress a bit smarter than usually and I went for this amazing stripy shirt from Mango. I love that long and unusual sleeves. In the back of the blouse there are buttons which makes it more interesting. Colorwise that is really plane and good for any kind of office look. I matched with a white trousers and the white stilettos for making the outfit very clean and on point. 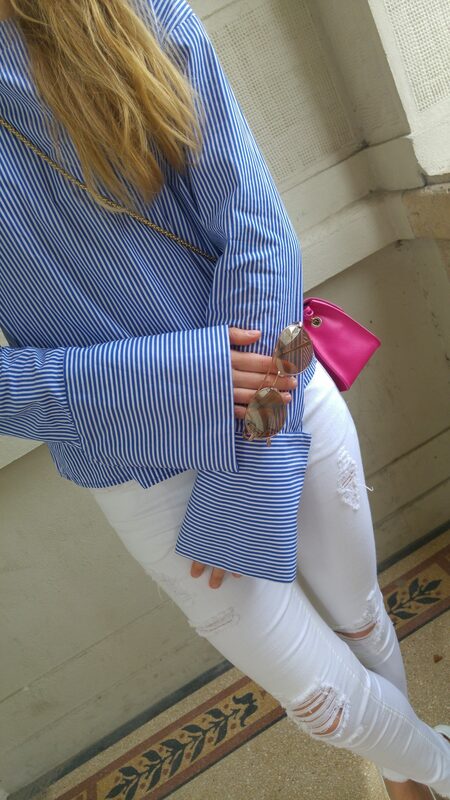 Of course I used my good, “old” favorite and I paired the outfit with my beloved Furla Metropolis Pinky. That bag just means the hole world to me since I got it last December.